You are here: Home / What is a Holistic Mouth? A Holistic Mouth is a healthy mouth sensibly used to build Mouth-Body Health. Using Holistic Mouth Solutions will improve your overall health. The National Library of Medicine lists over 10,000 studies linking the mouth to just 5 conditions: cardiovascular disease, sleep apnea, pregnancy complications, diabetes, and cancer. 137,000 studies relate the same 5 conditions to diet. 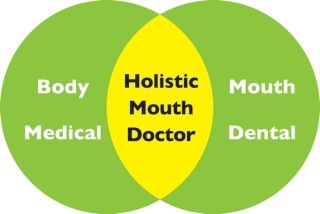 Having a Holistic mouth is a key player in the prevention and reversal of the above list of leading causes of death. Your health is what you eat and how well you sleep, whether you relax and/or exercise. 2. Lockhart, et al, Circulation. 2012; 125: 2520-2544. 4. Al-Delaimy, et al, Am J Epidemiol. 2002 Mar 1;155(5):387-93. 7. Kamer, et. al, J Alzheimers Dis. 2012;28(3):613-24.